We have seen images from Savute of leopards leaping into the mud to pull catfish from the sticky channel, and we’ve seen footage of jaguars catching caimans in the backwaters of the South American rainforests. 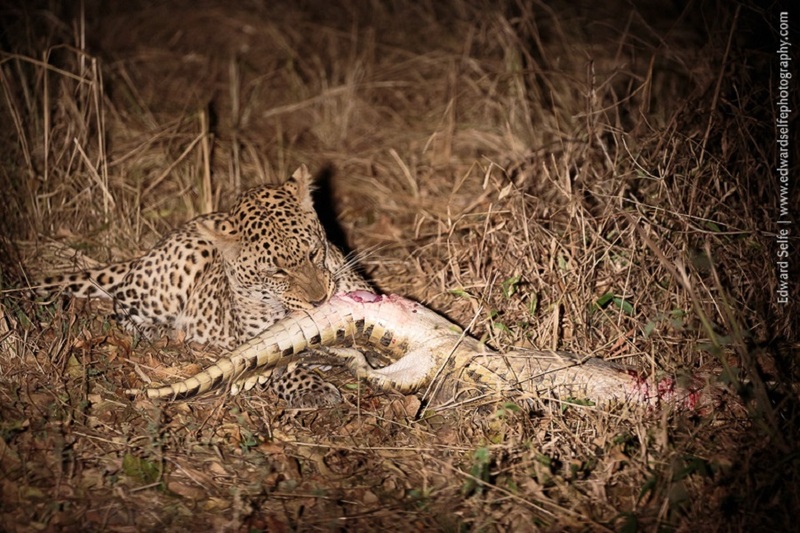 Now South Luangwa’s leopards are vying for their own place in the lime-light… by taking on crocodiles! We found this large leopard resting on a fallen tree at dusk. He descended and called, starting to mark his territory. We followed for a while and then lost sight of him when he went down to drink at the river. We drove away a short distance and took a quick break for sundowners – agreeing to return to look for the leopard after dark. After our break, I scouted around and it didn’t take long to find him again. I actually heard him rustling in the leaf litter before I saw him, and I immediately knew that he had to be carrying or dragging something (leopards move quietly even in dry leaf litter!). We re-positioned ourselves and saw that indeed he was dragging a carcass through the long grass. It wasn’t easy to see what it was immediately, until he turned towards us and we could see that he’d killed a crocodile! This is one of the most unusual sightings I have enjoyed in the nine years that I’ve been in South Luangwa National Park, and having talked to many other guides, it seems that few have seen it elsewhere either. One guide reported something similar from Luangwa a number of years ago, but nothing since. We gave him some space, and tracked him with the red filter on our spotlight. Eventually he stopped, presumably deciding that he had travelled far enough into the bush to avoid detection, and he started to feed on his prize. 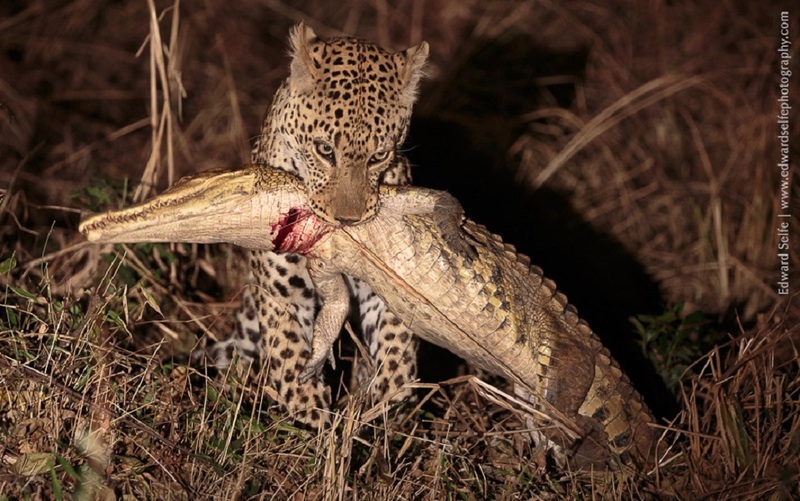 Initially, he grappled with the 2 meter crocodile, attempting to turn it over, and apparently re-enacting the struggle of catching it, but he quickly settled down to feed on the soft area on the underside of the tail. While he attempted to break through the tough scales on the soft belly – we contemplated how such an event occurred. How did he catch it? How did he kill it? Why would he choose a prey that turned out to be such a tricky challenge? We agreed that he had clearly gone for a drink, padding silently across the sand to the water’s edge, and found the crocodile resting nearby. The crocodile and the leopard were both dry, so we assume that the catch occurred on the sand, not in the water. After spotting the crocodile, the leopard’s opportunistic instinct kicked-in, and he decided to stalk the reptile. 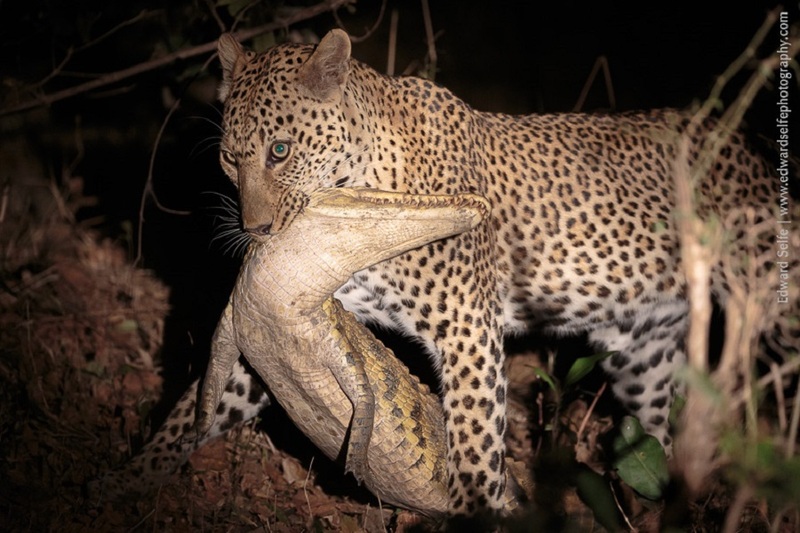 Leopard’s most popular killing technique – strangulation – would not work on a crocodile, unless he could seal the croc’s mouth closed and hold it for a very long time! So we assume that he killed the prey with a powerful bite to the back of the head and neck – the power required to achieve this is sobering. 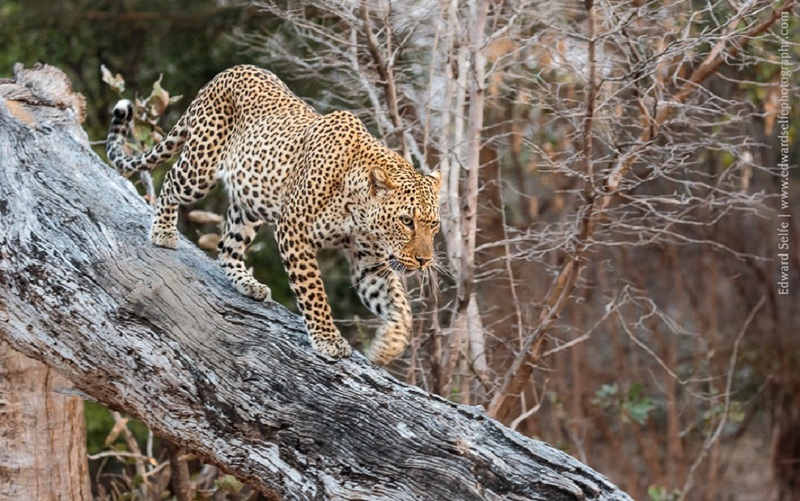 After he’d killed his prey – which would have been instantaneous with a bite to the head – he retreated to the bush, as any leopard does with a new kill, and it was at this point that we found him. Interestingly, his attempts to break open the prey and feed were fairly subdued right from the start. Without being too anthropomorphic, it appeared that he didn’t really like the meal that he had killed! We watched for about 30 minutes as he fed and occasionally moved the carcass around. He never showed the excited fervour that we see when a leopard has killed a baboon or an antelope and is taking the first few bites! We wondered if it was the first time that he’d killed and eaten a crocodile. Just when he appeared to be getting the hang of it, he stood up and wandered around the kill for a couple of minutes. He then sat, with his head held low, and his stomach started to wretch just before he vomited all of the crocodile meat that he’d already eaten. 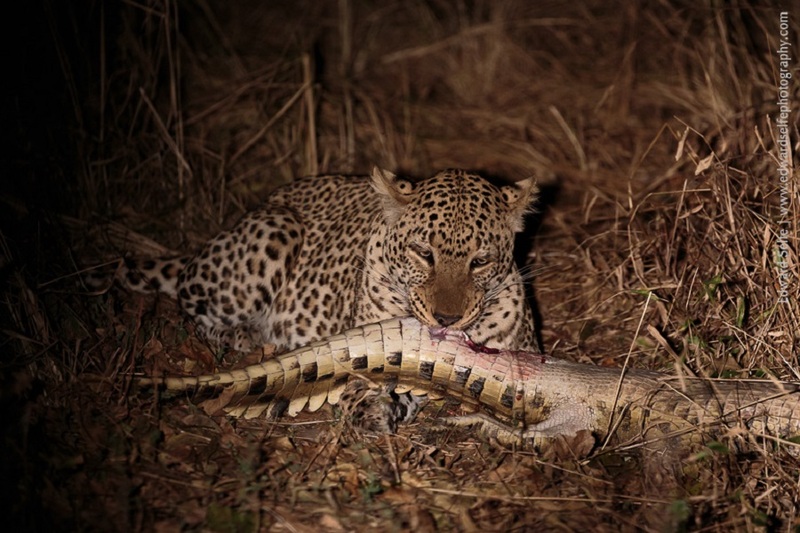 So it seems that Luangwa’s leopards are more than a match for crocodiles, but they don’t much like the flesh! It was fascinating to watch this encounter, genuinely wondering what would happen next. It’s times like these – when nature surprises us – that we remember how much there is still to learn about the natural world. This is Dr Rao, from India. My wife and I both Doctors are keenly interested in travel n wildlife. She as Wildlife Enthusiast and am Serious Wildlife n Bird Photographer. We are exploring of a trip to Zambia, for primarily Photography. Requesting you for some advice, if we want to come for about 12 days. Please have a look at our tabs for ideas on what to see, where to stay, what to do, and how to plan your trip. There’s plenty of information for your inspiration.